Oh no! Dave has scratched from this year’s race, due to sick dogs. He said that he saw some warning signs that something wasn’t quite right as early as the Carmacks checkpoint. After dropping 5 dogs by Scroggie Creek, the diarrhea bug that swept through his team finally proved to be too much. Around the Pelly checkpoint and Stepping Stone dog drop Dave’s dogs slowly lost their energy and motivation to run. He said that they had no power going uphill, and were slowing down significantly going downhill; it was, as if they were trying to hold their stomachs tight, fighting some kind of internal illness, and thus not giving 100% to running the race. Dave is a veteran musher of this race, having started 19 times. This is his third scratch. He knows his team well, and what their limitations are. Between Scroggie Creek and Dawson Dave decided to take a shortcut to Dawson, to make things a bit easier on the dogs. There is a section of the river trail that intersects the road system of Dawson City, and upon leaving the designated Quest trail, Dave officially scratched from the race. On top of that, he received outside help from me, his handler, when i drove about 15 miles out of town to pick him up at 11am this morning. Dave is resting at the home of our host here in Dawson, Shirley Pinnell, whom he has stayed with for the past 15 years. I am about to take all the dogs back over to the camp that I set up yesterday, and feed and care for them, as if they were continuing the race (as far as they know, they are!). We’ll probably stay here for a few days, before making the drive back to Fairbanks over the weekend. I am arranging for our drop bags at the Eagle, Circle, Central, and Two Rivers checkpoints to be returned to the Fairbanks Yukon Quest office, where Dave can pick them up on his way back to Healy. We’re waiting for the next batch of mushers to arrive. Kyla Boivin, Dave Dalton, and Wayne Hall are expected next, sometime in the night. The mushers who are already here just attended a mandatory mushers’ meeting with John Schandelmeier, a former Yukon Quest winner and veteran dog musher. He is the trailblazer for the Alaskan side of the race, and discussed the conditions for the second half of the race. He said he and the other snowmachiners have put in a great trail over the last few weeks. There is a little bit of glare ice (the frozen ice on the surface of a river that is solid, but in a windy area so the snow on top is gone, leaving it very slick and slippery) around the eagle checkpoint, but otherwise the trail is very well groomed, and should make for a very fast race. The winner might even break lance Mackey’s record of 10 days, 2 hours, 37 minutes! The trail being so hard-packed can be a blessing and a curse; however.attempting for fast run times on such uncushioned terrain can lead to more sore wrists and shoulders for the dogs (Dave dropped two dogs this morning, Matt and Gordon, due to shoulder injuries). It’s like running several miles barefoot on grass vs. concrete… but, the weather forecast over the next few days is for a few inches of snow in Eagl and circle, the first two checkpoints after Dawson, so that’ll be good for everyone. Dave has said it usually takes him about 15 hours to get to Dawson from the Scroggie Creek dog drop; he left just after 8am, after taking a long rest there, so I’m expecting him around 11pm, or sometime afterward. That’s the job of a handler: hurry up and wait! I’ll have some pictures of our campsite posted tomorrow, after the dogs have arrived. Dave Dalton left the Carmacks checkpoint this morning at 3am, in 19th position, after resting for 6 hours. Given his time out of Braeburn, his time into Carmacks, and the distance between the two, it looks like Dave has gotten into a conservative 6-on, 6-off schedule. I know in previous years he has pushed his dogs a little too hard too early, and he should be able to sustain this pace throughout the race. Dave also dropped two dogs here, Rachael and Joey, both due to swollen wrists. Minor injuries are commonplace during such a challenging race, and all mushers carry bandages, wraps, ointments, and various medications to keep their dogs going. Dave felt that even with these measures, the condition of these two dogs would only continue to deteriorate, and so he took them out of the team. It is 70 miles to the McCabe creek dog drop, and then 50 into the elly Crossing checkpoint. If Dave runs straight into McCabe, at an average of 10 mph, he should arrive around 10am, and I’ll be departing shortly. So far, 9 teams have left the first checkpoint, and are on their way to Carmacks, 124 trail miles away. Dave Dalton arrived at 1:45am, and the team is still resting, after having completed their mandatory 2 hour layover. Many handlers, officials, vets, and fans are packed into this tiny roadside restaurant, huddling around the wood stove and ordering world famous cinnamon buns. We’re all tying to stay awake, to support our mushers as they leave. But, as usual, who knows when that will be? Several mushers chose to sleep a bit late, and wait until the cold temperatures warm up. New mushers & handlers from the quest 300 (which started saturday at 5pm) are constantly arriving, as well. Everything at the start chute this afternoon went smoothly, as dave and i prepared the sled and gear and dogs ready for another 1,000 mile odyssey. dave left precisely at noon, under clear, sunny skies. I’m back again from California, as handler for Dave in this year’s Yukon Quest. My previous two times were in 2007, and in 2004, when Dave finished with all 14 dogs. I’ll have my laptop at all the checkpoints, so hopefully this will be the first of many updates. The first event we attended here was Wednesday night’s ‘meet the mushers’, where the public can meet the quest mushers face to face, get autographs & merchandise, and just get a general feel for what the world of professional dog mushing is all about. Hors d’oeuvres were provided, and it was a great way for old friends to reconnect and introduce new fans to the race. The race officially starts Saturday morning at 11am, in downtown Whitehorse, with mushers leaving the chute every 3 minutes. Thursday night at the start banquet at the high country inn Dave drew number 21. It was a sold-out event, and proceeded rather quickly – in previous years, the banquets have tended to be quite long-winded and tedious. All of the 29 mushers had very positive things to say. This year’s roster includes a terrific mix of rookies and veterans to the Yukon Quest race. Hans Gatt, 3-time champion, is back, as is William Keedehn and front runners Sebastian Schnuelle, Brent Sass, Michelle Phillips, and Hugh Jeff. Iditarod champion Martin user is registered this year as a ‘rookie’ because he has never run the Yukon Quest before. It should be a very good trail this year, as both the Yukon and Alaska got a lot of snow; the Canadian rangers as usual have established a very well-groomed tail on their end, and veteran Quest musher John Schandelmeier has done a superb job on snow machines putting in the Alaskan side. The weather looks good too: there will be a cold front during the first few days of the race (around -26 degrees F), but the rest of the race appears to be in the 10 above to 10 below range. Dave also wanted to talk about the race purse this year, the money awarded to the top finishers. The number is less than previous years, by about $50,000, actually, and so a special bank account was set up in Alaska for donations to the race organization. If anyone wishes to make a financial contribution to the Yukon Quest mushers and show their appreciation and support for the race, donations can be made simply by visiting your local branch or by calling the bank and saying you want to help the 2009 Yukon Quest mushers. it is a very fast and easy process, and the mushers are extremely grateful for all the support they receive from the community. 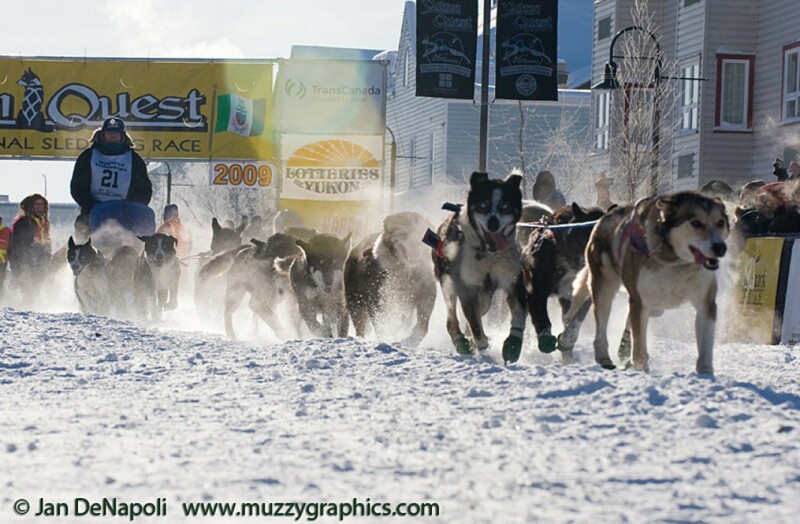 The 2009 Yukon Quest International Sled Dog Race will start on Saturday February 14th at 11:00 a.m.from downtown Whitehorse. Join us for this epic two weeks of sled dog racing over 1,000 miles through arctic winter wilderness! Watch here for Dave and the gang’s updates from the trail. Pre-Race Update: I’ll be leaving Healy with the Gang for Whitehorse Feb 7th with a stop in Fairbanks for Vet check on the race team with help from Lee Lowery. Then Sunday Feb, 8th running the team from the last check point Twin Bears (a new check point this year replacing Chena Hot Springs) on a new section of trail for the team to the Finish line. Then on the 9th Peter will be flying in from California and I’ll pick him up and we will head for Whitehorse. Arrive Wednesday Feb 11 for Pre-race Meet The Mushers for media and fans. On the 12th Mushers Meetings and Thursday evening the Start Draw Banquet.